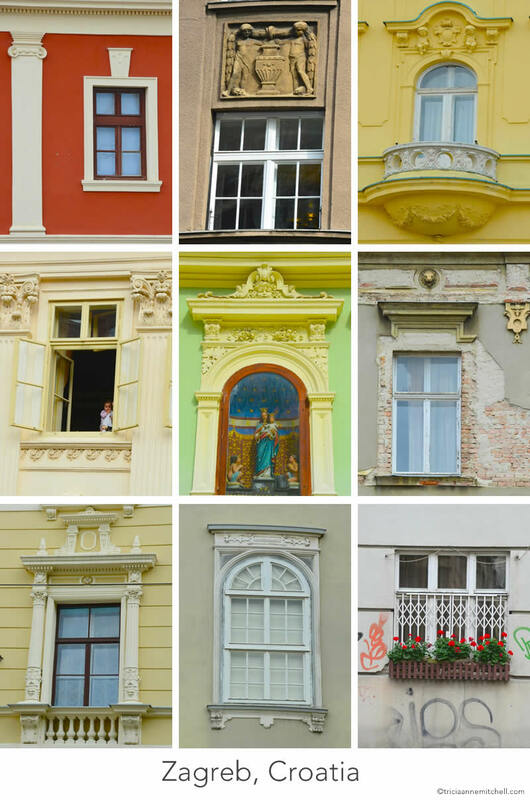 My ‘window collecting’ mission in Zagreb, Croatia’s capital city, was as hurried as our day and a half there. Arriving via Germany, Austria, and Slovenia earlier in the morning, we settled into our apartment, and took to the streets, while dodging raindrops and securing some goodies at one of the local supermarkets. Our whirlwind exploration took us to a café where we enjoyed Latte Macchiatos, then to St. Mark’s Church, probably one of the city’s most well-known landmarks thanks to its brilliant-colored tiled roof bearing the coat of arms of Zagreb. Though I have been to Zagreb twice, I haven’t given the city the attention it deserves; both times, I was en route to Bosnia-Herzegovina. And as regular readers of this site could attest, when we have devoted extensive chunks of time to Croatia, we’ve spent most of it exploring the country’s twinkling Adriatic Coast. The winter temperatures in Dalmatia are simply more alluring than the country’s continental climate, and we yearned to escape Europe’s brutal helpings of ice and snow. But the winding cobblestone lanes of Zagreb’s Old Town are etched in my memory. So too is its promise of eclectic museums as well as its varied architecture, much of which harks back to the days when Zagreb was part of the Austro-Hungarian Empire. And so it would be that we had a hasty rendezvous with Zagreb, before hopping on a bus bound for Sarajevo where we’d commemorate the 100th anniversary of the start of World War I , when Archduke Franz Ferdinand, the heir to the Austro-Hungarian throne, was assassinated. I’d also do more ‘window hunting’ in Sarajevo. Though Zagreb is deserving of a longer stay, most of my trips there, I have been in transit. One December, Shawn and I stayed at Apartment Lucy City Center Rooms (affiliate link). The apartment was compact, but since it was centrally located, and had a pleasant kitchen and bathroom, it offered everything we needed for one night. The Uber ride from Zabreb’s train station to Apartment Lucy was a short one, too. During a summer stay, we spent two nights at the ApartMeant To Be (affiliate link). The host was friendly and helpful, and the apartment was spacious and within walking distance to Jelačić Square and the Dolac Market. For more on the city’s sites, see the Croatian National Tourist Board’s website. Hi Karla, there were a plethora of ‘candidates’ to choose from in Zagreb, and I appreciated that while some buildings were impeccably groomed, others exuded a more gritty character. Thank you for reading! Undoubtedly, more windows will be on their way, Karla. Glad you like the series, and wishing you a happy weekend ahead. I love this collage! I recently spent 3 weeks in Italy and tried explaining to my friends how the ceilings in museums always captured my attention first. The architectural details of a city really enhance any travel experience. Thanks for sharing! Claire, you’re spot on in highlighting Italy’s beautiful ceilings – not only in museums, but also in loggias. (The Uffizi’s, and the cities of Bologna, and Modena come to mind.) Are there any favorites from your recent adventures? I honestly think I spent half my time in the Vatican Museum looking up instead of at the artwork on the walls. And the ceiling in Florence’s Duomo was absolutely stunning. I love taking pictures of windows and doors when I travel. What a great collection of them! Laura, in some respects, photographing them is a way to recognize talented craftsmen of days bygone, isn’t it? Glad you enjoyed the latest in the windows series; thanks for your kind words! I love following small, unique architectural details in cities…Treviso is also a great one for windows. Nice post – I’ve also wanted to spend more time in Croatia and I also feel like I always end up in a rush! What part of Croatia have you visited? Shawn and I were fortunate to have wintered there two years in a row – once in Trogir, later in Split. After nearly 5 months there, it feels like home in many ways. I’m happy to share ideas if it looks like you’re headed back soon. Wish you a wonderful weekend ahead, and thanks for your comment. Hey Tricia! So sorry for my long delay. It has been a crazy period with the wedding, and then my computer broke! :-/ That’s great that you got to do day trips to all of those beautiful areas. It is such a nice region. I’ve only been to Zagreb unfortunately. I have some friends that live there. But I’ve actually wanted to do a summer trip to Croatia because I’ve heard it is beautiful! Peggy, no worries. I seemed to have missed news about the wedding, and who the happy couple is. :) Surprisingly, I haven’t spent much time in Croatia during the summer months, as we set up our temporary home there during the winter/early spring in 2013 & 2014. The weather was quite pleasant then, and the ability to have many of the towns to ourselves was priceless. Hope you’ll get the chance to make it again soon! Great collection of windows Tricia! What percentage of Zagreb would you say still retains the architecture of its Austro-Hungarian past? Bespoke Traveler, you ask great questions! Having only been on two whirlwind jaunts through Zagreb (often in transit) I would say that there’s a blend of buildings from the city’s Austro-Hungarian and Yugoslavian chapters of history. In this collage, I focused on the frillier buildings from the former time period, but like other cities, Zagreb also had boxier Socialist structures and graffiti. From my first visit in 2007 until this one in 2014, I noticed the city has become much more primped and polished. It’ll be interesting to see how it’s evolved the next time we’re back. Sounds like the polish of tourism is taking over Zagreb. It will be interesting, as you say, to see whether any of the boxier Socialist structures survive the primping. Hi Tricia – thank you for sharing. Made my day. Ruta, that’s lovely to hear; thank you so much! You always find the most amazing windows. Great photos. I LOVE those pictures…I really hope to visit Croatia in the future! Thank you, Kendra. My husband and I have been fortunate to have spent two winters in Croatia, however, we were mostly along the coast and not in inland spots such as Zagreb. From tasty homemade Mediterranean food, to good wine, history and kind hosts, our months in Trogir and Split were memorable. We heard there are a plethora of beautiful castles and villages to visit inland, and so hope to get back to Croatia soon. I wish the same for you as well! Wow. I am SO looking forward to when you go again, so I can see more of gorgeous pictures! Great post!! it sounds like a charming area, Tricia, but I can understand “winter destinations” and Zagreb wouldn’t be ideal. Love your window collection, especially the open window with the baby. Hi Lynne, as a Floridian accustomed to pleasant winters, I can see why you relate. :) You’re right about the baby being the star; it was fun that her mother kept her in the shot. Another lovely architectural photo essay! I lived in Zagreb in 1996 – appreciate the walk down memory lane. Hi Jamie, thank you! How interesting that you lived in Zagreb in the ’90s. If I may ask, what type of work brought you there? I bet it was a fascinating period of time to call the region home. Randall, it sounds like your sister and I could succumb to shutterbug mischief if ever our paths crossed. :) Number 4 was also my favorite, as I appreciated the silent interaction I had with the little one’s mother, and of course the life that the child added to the set. Hope your week is going well! Hi Aby, how nice to hear that you enjoyed this peek at Zagreb’s architecture. From collages of windows, to Moldovan water wells, Spanish tapas, and Bulgarian roses, I’ve been having fun with this series. Thank you for reading!